So over the last month or so we’ve started construction on our new house. 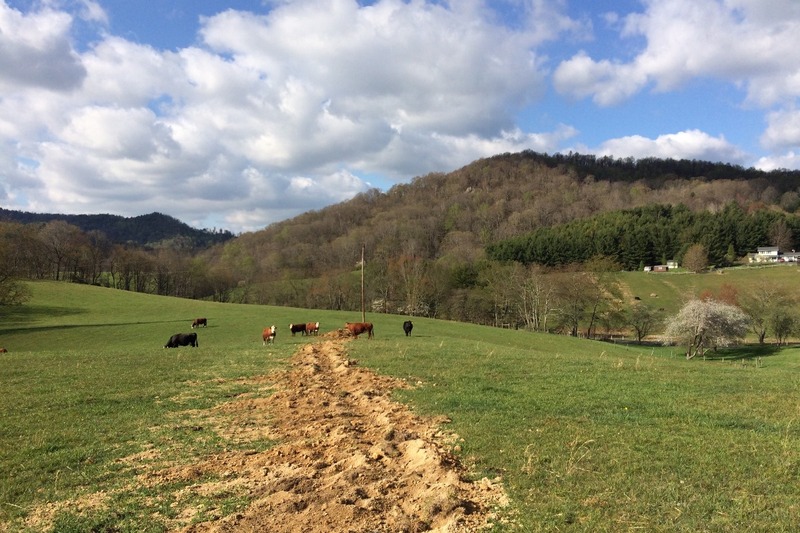 I say we but in truth, I haven’t done much of anything yet but put up a temporary fence to keep the cows out of the construction site (not our cows; my neighbor rents our 14 acre pasture). We’ve hired someone to get us under roof. My work starts with the interior partition walls and utilities. In the mean time, the Mrs. and I decided that today would be a good day to sort through the wood pile in the barn. Our old barn, probably built in the 1930s or 1940s, is a bit run down, but has a ton of character. It’s one of the things that attracted us to this property. You see the previous owner was a woodworker, and he left a rather large, disorganized pile of lumber in the barn loft. We’ve put off going through it until now because the barn is in a pretty sorry state and during the warmer months it’s full of wasps and hornets. But it was cool enough today, without being too cold, that they weren’t really active, so we took the opportunity to go through the pile to see if anything could be salvaged. Turns out, a lot of it wasn’t all that bad. A large stack of old, pre-finished tongue & groove oak boards on the left. These were likely salvaged wall paneling. On the right, a minor mystery. Probably half of what was up there was pre-finished tongue and groove oak that was likely salvaged wall paneling judging by the electrical box cutouts we found in several of the planks. Many of these were bug eaten or rotted, but I may be able to salvage some of them for shop wall boards or cabinet backs or something. On the right is a partial pile of mixed softwoods. Definitely some pine (eastern white & southern yellow) and maybe some white cedar as well. On the left, that mystery pile. Could it be chestnut? Next, there was a bunch of pine. A lot of this looked like it was sawn as barn wood, probably for siding. It may even be a mix of pine and white cedar, I’m not really sure. We brought some nice 14″ wide white pine boards down, as well as some other better looking cabinet grade pine and a few of the barn boards before deciding to leave the rest of the barn wood in the loft until we restore the barn. 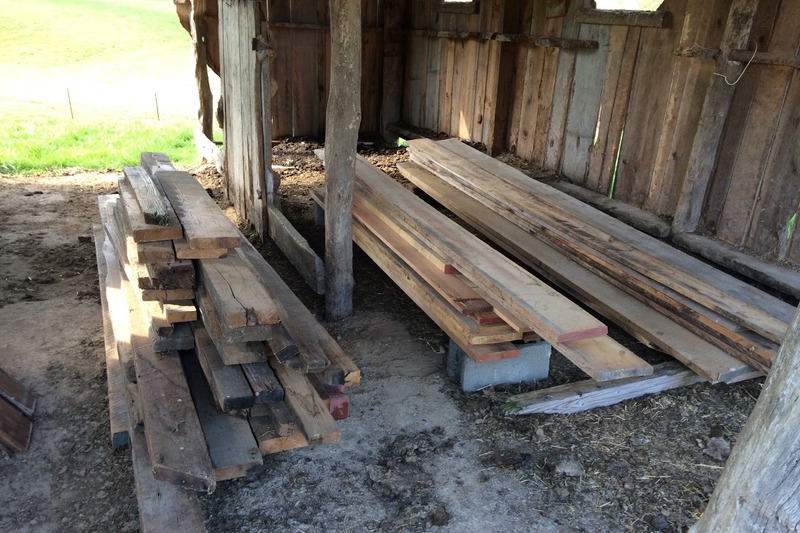 There was also a bunch of salvaged lumber that I think might be American chestnut (the left pile above). Having never seen American chestnut in person before, I’m not 100% sure that’s what it is. It has the face grain pattern of red oak, but the open pores are a much darker brown than red oak. And it’s definitely not white oak. It also weighs a lot less than oak. Maybe half what you’d expect an oak board to weigh. And it has lots of worm holes, which doesn’t really mean much, except that none of the other boards that were up there had worm holes like these boards. I’m going to plane a piece of it up and saw off one end to have a look. I’ll post more about it once I do. Are there any chestnut experts out there who can help identify it? On the left, a pile of black walnut. In the middle, red oak. On the right, a pile of cherry. Then we got to the good stuff. There wasn’t quite as much furniture wood as there was barn wood, but there was enough to keep me busy for a little while. While we left the T&G oak paneling, chestnut and pine back in the barn, we did load up the really good stuff to bring back to the shop. 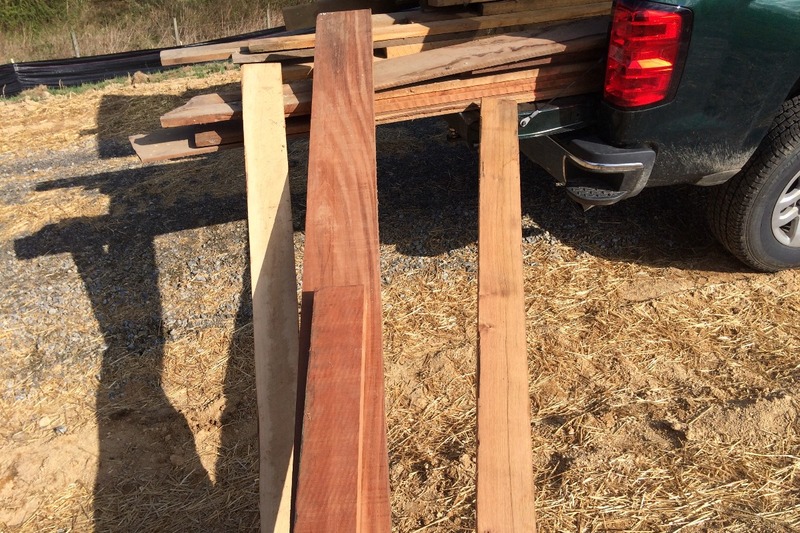 On the left above, is a stack of black walnut in various widths and thicknesses. On the right is a similarly sized pile of cherry. In the middle, is a slightly larger pile of oak. This lumber was mostly S2S, but also looked to be primarily FAS grade and perfect for furniture. Maple, mahogany, and a piece of the mystery wood I think might be chestnut. As a bonus, we also found what appears to be a small piece of maple and a couple pieces of 6/4 mahogany. On the right is a board of the mystery wood that I think might be chestnut. Not bad for a day’s work. And you certainly can’t beat the view. The view from what will eventually be our front porch. The white flowering trees down the hill to the right are our apple trees. Heirlooms. Old and large, with lots of apples come late summer. Posted in Materials, Wood and tagged cherry, chestnut, oak, walnut. 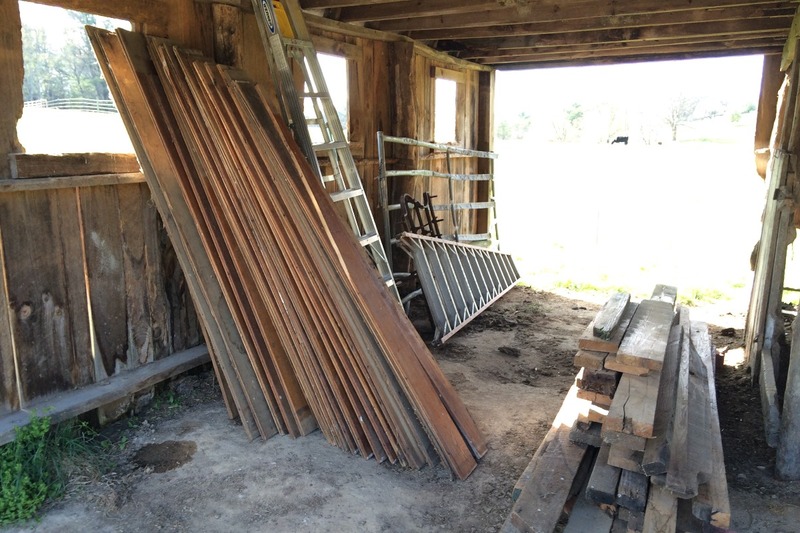 Your barn pics and lumber finds look awesome. Thanks for sharing. I have lurked a long time at Logan cabinet shoppe and your hand tool work has been a large catalyst in me finally getting into hand tool and woodworking in general. So thank you for that! With that said, just based on your description of the “chestnut” board, I’d say yes, it’s American chestnut. 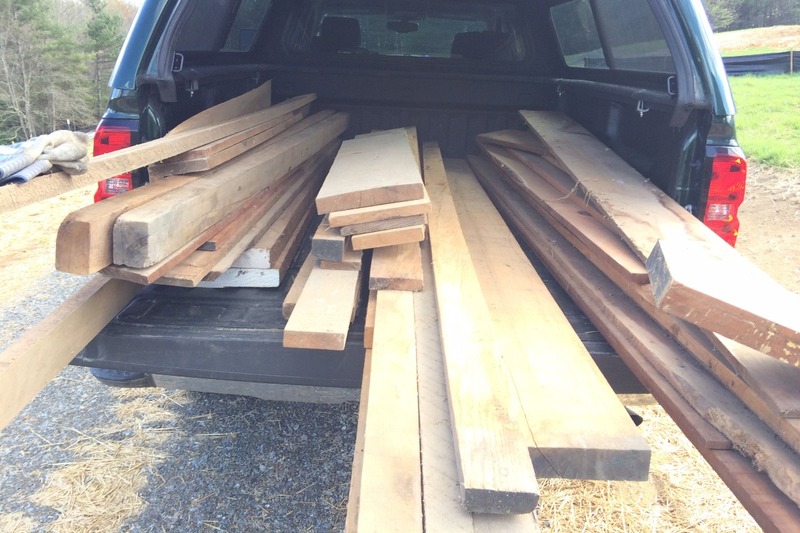 I have done a good deal of work up here in the Shenandoah valley with old barn boards, and only a handful of species were generally used for lumber, with chestnut being chief among them, and oak, poplar, and pine being the rest. From the pic, I’d say chestnut as well. One other tell is when you plane or sand the board, the grain will sparkle a bit in the light. Glad you had your own personal stash waiting for you to discover, that’s sweet. I hope your house construction goes smoothly, and will look forward to following along! Thanks Nick! That’s more or less what my research has pointed to so it’s good to get some validation. House construction is coming along. Foundation and basement/garage walls are done. Logs should be going up soon. I’ll post some progress pics when there’s a bit more done. Concrete block walls aren’t that interesting. LOL. You are most welcome! It’s good to hear that construction is moving forward. 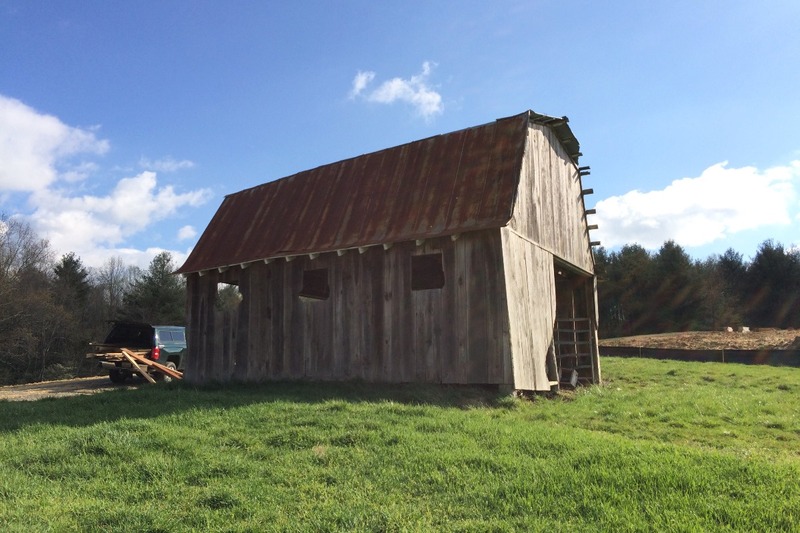 Are you using reclaimed logs, hewing your own, or putting up a kit? Any particular species? I have a small pile outside of reclaimed logs to add an addition some day, but they are so darn heavy (white oak) that it’s going to require some ingenuity (a homemade crane) and extra help to get them notched and situated. In the meantime, my wife has me building a mobile chicken coup and other farm-style infrastructure, so it’s slow going on the dream, but there is definitely some comfort in having the logs piling up! Not really a kit. It’s a custom design, but we’re using milled white pine T&G logs with precut dovetail notch corners. They’re 8 x 12 flat milled and then the exterior is hand hewn so that they sort of look like hand hewn logs except that they’re all a consistent 8 x 12 and perfectly straight. So kind of a cross between a traditional Appalachian log cabin and a modern milled log kit. I just don’t have the time nor the desire to do a full traditional hewn log house, though we did consider it. We’ve hired someone to build the foundation and erect the logs. We’ll finish out the interior ourselves once the house in under roof. Sounds like a really neat project, Bob! Thanks for providing the details. Pine makes for a beautiful cabin!